Are You at Risk for a Loading Dock Accident? bay door, with a dock plate used to bridge the gap between the truck and the building. Then workers use forklifts or hand trucks to load or unload heavy products, which are usually on pallets. A Loading Dock often has more than one bay, with more than one truck being loaded or unloaded at a time. It is a very dangerous area. With so much activity, involving large numbers of people, machinery and products, the potential for injury is very high. Loading Dock accidents often cause back and neck injuries, herniated discs, fractured bones, head injuries and lung disease. It is also very common for a worker to severely hurt his foot or leg in a Loading Dock injury. Often a worker’s foot will get caught in the area between the truck and the bay and then get twisted. This can cause very bad ankle and knee injuries, including torn ligaments or a torn or ruptured meniscus. There are certainly ways to reduce the risk of Loading Dock injuries. A worker should make sure that all tools and equipment are in good shape and are used properly. The truck should be properly chocked to avoid slippage. The area inside the building should be free of debris and water or oil, to avoid slip and fall injuries. Finally, and probably most difficult if a supervisor is pushing to get a job done quickly, the worker should move at a normal, deliberate pace. 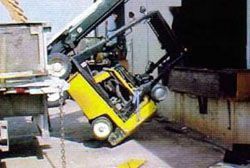 If you have been injured in a Loading Dock accident while at work in New Jersey, you may be entitled to compensation. Manfred F. Ricciardelli, Jr. has over twenty years of workers' compensation law experience. He will help you prepare your case and fight for you in court. For your free consultation, please call our office immediately at (973) 825-1100 or fill out our online contact form.